The SoxProspects podcast team released their most recent episode Wednesday, the first since their trip to Spring Training. The guys previewed the minor league season for the Red Sox system from top to bottom and highlighted which players they are excited to see after getting a good look at many of them this spring. 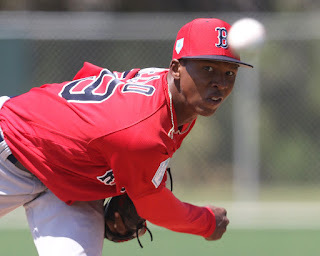 SoxProspects has begun overhauling the layout of our player pages in order to make scouting reports, stats, and photos easier to for you to access. For now, the update will apply to the top-10 prospects, but player pages will be updated as prospects enter the top 10 and may be expanded to the top 20 prospects in time. After a short rehab stint with the Drive, the Red Sox have activated Dustin Pedroia, optioning Tzu-Wei Lin in a counter move. Rain and snow combined to make this week a slow one, with a total of seven games being postponed due to inclement weather. For Salem, Ryan Fitzgerald and Jarren Duran each had a big week, collecting seven and six hits respectively. Josh Ockimey also had a big week, reaching base five times and leading a Pawtucket comeback Monday night with a two-run home run. Triston Casas added a long ball of his own on Wednesday night, the first of his young professional career. Brayan Bello (pictured) impressed in his debut for the Drive on Tuesday night. The young right-hander went five innings, only giving up one run and striking out three. Mike Shawaryn bounced back well from his rocky opening day start by striking out seven batters over six strong innings. John Calvagno of Notes from the Sally fame got a first look at Triston Casas on Opening Day and provided a detailed scouting report on his website. Calvagno raved about the lefties raw power which he rated as a 70. In his Daily Prospect Notes column, Eric Longenhagen of Fangraphs highlighted Darwinzon Hernadez's impressive season debut from Monday night. Longenhagen gave a brief scouting blurb on Hernandez as well as providing some live video taken from his time in the Arizona Fall League. While many do not see Hernandez as a long term starter, John Tomase of NBC Sports Boston sees reason for optimism following Hernandez's strong start. Tomase argues that the Red Sox sent a message by grouping him with the major league rotation during Spring, and that should the need arise the Red Sox could call upon Hernandez for a spot start. Despite the Red Sox less than start to the season Rob Bradford of WEEI looked to the minor leagues for encouragement, specifically Jarren Duran's four-hit night on Tuesday. Bradford summarized Duran's path to becoming what one exec described as "one of the most asked about prospects in the Red Sox System". As a part of autism awareness month, Red Sox 2018 draftee Nick Northcut is raising money for Family Initiative, a local Fort Myers non-profit that helps support families across Southwest Florida. This is a fantastic initiative that will help give back to a community that has given so much to the Red Sox and their fans over the years. Tanner Houck is also raising money this season for Caritas Family Solutions, an institution specializing in adoption and family services in Southern Illinois. Houck's younger sister Reanna joined his family through adoption so this is a cause that he has a special connection to.